San Antonio Spurs meant serious business in Miami by nearly destroying the Heat from the first blow of the whistle and finally defeated the Heat 111-92 . The Heat players found no answer to the fast footed Spurs' players and they seemed non-existent on the pitch. 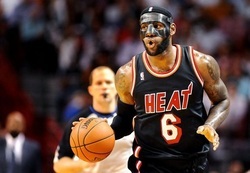 LeBron James was forced to remove the mask he wore on his face. The Spurs at the end of the first half led with 21 points. With its victory in Miami, it leads the Heat in the NBA final 2-1. It was not a pleasant night for the Heat that played to catch up. The first quarter ended 41-25 in favor of the Spurs. And led the second quarter from the beginning comfortably maintaining 20 points lead. The Heat struggled and reduced the Spurs lead to 18 points. Immediately after, the Spurs regained its 20 points lead with the scores at 60-42. Thereafter, the Heat reduced the deficit to 17 points and with scores tied in the 23-23. The Spurs continued its goal harvest and put a big question on the game about whether the Heat will recover from the night's devastation. The Heat began to show signs of recovery at the resumption of the third quarter scoring the first six points and reducing its deficit to 15 points. Just as the Heat struggle to surge, the Spurs struggled to maintain its lead. The Heat gradually reduced the Spurs lead, but the Spurs was unrelenting on maintaining its 15 points lead, while the Heat chipped off the lead and at about 1 minute to the end of the quarter, the Spurs lead had been reduced to 10 and then 9 points. Will the Heat turn the table against the Spurs in the fourth quarter and the question makes the quarter a fight to finish for both teams. But it appeared the Heat ran out of steam in the third quarter, and the Spurs overran Heat and cemented its lead with 19 points in the fourth quarter.